In medium bowl, combine oil, vinegar, mustard, garlic salt and pepper; beat well with wire whisk. Add mushrooms; toss to coat. 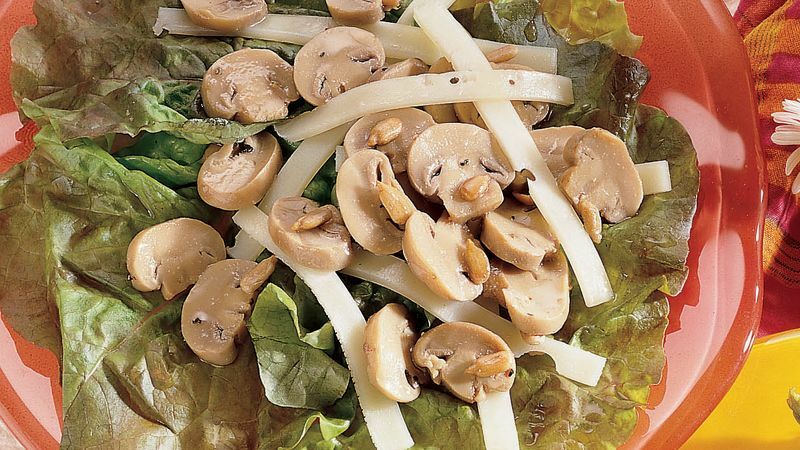 Arrange lettuce leaves on individual salad plates. Top with half of the cheese strips. Spoon mushroom mixture over cheese; top with remaining cheese. Sprinkle with sunflower seeds. *Two tablespoons red wine vinegar plus 1/4 teaspoon dried tarragon leaves can be substituted for the tarragon red wine vinegar.